I think chick-lit is usually a bit cute and funny at moments but I have to say that Sophie Kinsella's Can You Keep a Secret is super special. I giggle a little bit just thinking of it. It's not just that Emma is a bit quirky and her inner reflections are laugh out loud funny, but it is also the way the other characters respond to her. They tease her and react to situations it the most hilarious ways. This book was funny because every character was funny even when they weren't trying to be. The situations were hilarious and Emma's secrets were funny because they were so real. For example, when one of Emma's roommates and very best friend finds out one of her secrets, her subsequent reaction to Emma is so funny. I couldn't had to rewind and listen to the section twice! Emma is a cute quirky character that probably shouldn't have told all her secrets to a stranger on a plane even if she thought she was going to die. But then again, the ticking time bomb on the information made this book all the more fun. I can't help but love books where the humor isn't forced. Funny just happens and I love that! 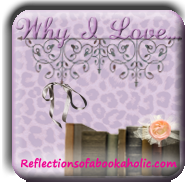 Which humorous reads do you love? Feel free to create your own post and link up. Don't want to create an entire post? Tell me your favorites in the comments. Thanks for stopping by for another week of Why I Love Wednesdays!! I'm good on the humorous books. darn, can't think of one now. chick lit is the genre that i think delivers the most of humor. It does. I don't tend to read books that are supposed to be funny I don't think. Like I see people reading Bossypants. Not really my thing. I have that book. Now I need to get to it much sooner. You have to listen to Beauty Queens audiobook. AMAZING!! You must get to it soon! I'm on the wait list for Beauty Queens and I'm next. I love this one too! It's soooo funny. I giggled and giggled. The chick lit genre is usually good for producing books that can give me a good chuckle. I haven't read this one yet, but I'll have to get to it someday. You should get to it soon! It's so great. I heard about that author, I think she wrote Confession of a Shopaholic, and I did see that movie. I thought it was fun enough, I may add this book to my TBR list. I don't remember the last time I read a humorous book that made me laugh out loud. Maybe I should pick one up soon. Summer is the best time for light fun reading anyways! She did and I saw the movie and got bored. This is nothing like that. I'm not going to read the shopaholic books because I think the movie might have ruined them for me. Summer is the best time for fun reading. I love Chick-Lit ---it is my guilty pleasure! When I get in a funk I can always depend on it to make me smile. Plus, the gals are always such fun hot messes! Although I have more things to post about than I know what to do with, this is a terrific feature and will try to work it in on occasion.